Gainesville, FL – The men’s track & field team ranks second after one day of competition at the NCAA East Region Championships. The meet is being held at the Percy Beard Track Complex on the University of Florida campus. Mitch Greeley and George Fields highlighted the Tigers’ efforts Friday by earning automatic bids to the NCAA Outdoor Championships. Greeley was runner-up in the pole vault, while Fields placed fourth in the long jump. Greeley broke his own school record and established a personal best with a clearance of 17’9″. It marks the first time Greeley has earned an automatic bid to the NCAA Outdoor Championships. He competed last season as an at-large invitee. His second-place showing is also the best finish by a Tiger in the vault in the short history of the regional format. Fields’ fourth-place effort was a season-best mark of 24’7″, which he achieved on his final jump of the preliminary round. He did not improve on his mark in the finals, but was not surpassed by any of his competitors. Fields, a sophomore, will participate in his first-ever NCAA national meet on June 6-9 in Sacramento, CA. C.J. Spiller ran a 10.69 and was 18th in the field of 30 sprinters. Saturday’s final is scheduled for 6:35 PM. Padgett rebounded in a big way in the 200m dash. The sophomore from Shelby, NC shattered his previous best in the event and won his heat with a time of 20.67 seconds. His previous best was 21.04 at the ACC Championships last month. His time tied for third-best Friday. He will compete in Saturday’s final at 7:30 PM. Corey Brown (21.05) was 12th in the 200m, while Ford pulled up and ran a 21.39. Andrew Porter was second in his heat in the 400m hurdles. Injured and unable to compete at last year’s regionals, the sophomore from Budd Lake, NJ matched his personal best with a time of 51.36 on Friday. He was ninth-fastest overall, one spot shy of qualifying for Saturday’s final. The 4x100m relay team of Ford, Padgett, Spiller, and Brown advanced to Saturday’s final by posting a time of 39.87 in the second prelim. The Tigers won the heat and posted the third-best time in the preliminary round. Florida State and Florida were the top two teams. Matt Clark just missed an automatic spot in the NCAA Championships after finishing sixth in the 5000m run. The red-shirt junior from Hyannis, MA had a personal best time of 13:57.27. Clark improved his position greatly in the final two laps of the race thanks to a strong sprint. He will await a potential at-large berth in the event. The Tigers return to action on Saturday for the conclusion of the East Region Championships. 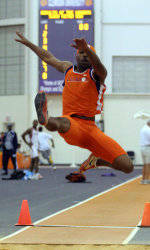 Clemson’s first action will be at 1:00 PM, with Adam Linkenauger competing in the high jump.